Starring: Amanda Stenberg, Nick Robinson, Anika Noni Rose, and more. Boy meets girl, girl meets boy. One of them have some kind of element stopping the love from happening whether it be sickness, unwelcoming parents, some wild personality flaw, or whatever. Now the two of them must find any way possible to make their new-found love happen no matter what. Sound familiar? Well that is because it is the formula used in every single young adult romance film that hits theaters that brings the teens (and some outlier audiences) in droves. Let us not forget most of these are adapted from outstanding novels, in most circumstances, that bring said novels no justice in its true quality. Well that leads us to this review. 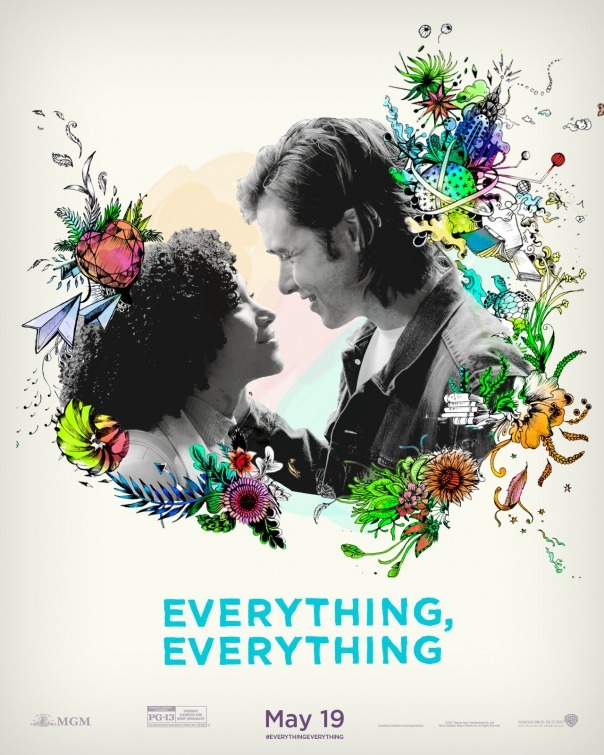 Here we have the latest young-love story to hit theaters in the form of ‘Everything, Everything’, based off the novel by Nicola Yoon. These young adult adaptations have been popular among the young crowd for years now, but it is time for eyes to reach this film that is focusing on the entertainment value of the film instead of how cute the lead actor’s smile is. Oh…em…gee. ❤ Time for ‘Everything, Everything’ to get Oberrated. Be shocked, ‘Everything, Everything’ was much better than I expected. Now calm down, it is no where near a masterpiece or even of being some entertaining legend for the year. What I am saying is, for what it is worth considering the genre of the film, it was much more entertaining and interesting than the typical young adult film. While having some flaws or minor annoyances, the good of the film genuinely carried it to success as far as the Oberrated scale goes. For the good, the acting was impressive given its young and limited cast. Amanda Stenberg as Maddy Whittier not only delivered her lines with passion and attacked them with reckless abandon but she portrayed her emotion through her body language. With even the subtlest gaze, she radiated love for Olly Bright (Nick Robinson). It was quite enjoyable to watch unfold. On top of the love Maddy showed Olly, the chemistry was clear as day. On frequent occasion, I witness cringe-worthy on-screen relationships unfold in these young adult films where the actors should interact with a tree instead of each other since we would witness the same exact chemistry unveil itself. The two portrayed a genuine love for each other that is rare to see sometimes unless the film is headlined by seasoned actors. Now for the bad and shockingly enough, it is mostly petty small things. One, how in the world does an 18 year old locked in her house for her whole life, no work experience, no credit history, apply for a credit card that can afford a round trip flight for two to Hawaii, rent a luxurious resort room for two, and rent a Jeep Wrangler? What? I even had speculation that when Maddy applied for the credit card, we as the audience see the application form on the laptop and MAYBE she put in her mom’s credit information. This would have been a more than okay proof of credit but as it stands, Maddy did fill in her own information. Not a fan… Other than this, most other flaws are just the subtlest things and to be honest, they were not ground breaking for me to even bring up. Now to be honest folks, that is all I have for the bad. I know, shocking right? Beyond that one little glaring point to me, ‘Everything, Everything’ was one of my better experiences with the genre. I rarely felt that it was corny or ridiculous. No eye rolls (which tend to happen frequently). Just a genuine interest in the film and and a story I could get behind. One thing that drastically affected my positive outlook on the film was a not so typical ending. These young adult romances typically end all the same and I was pleased to see it end not in the stereotypical way. If it did, my rating would have been drastically lower. ‘Everything, Everything’ gives off every vibe of just another ‘Fault in Our Stars’ but impressively enough, it somehow does something just a little differently. Whether it was the clear chemistry and/or the fantastic acting ability given off by Amanda Stenberg, it ultimately results in a product that is pure and genuine that shows a young love as innocent and honest as it could be. Besides minor petty things, there is not much to complain about. Being a typical young adult drama, I can not give a stronger rating but all things considered, this is a glowing thumbs up for ‘Everything, Everything’. Posted in 2017 Movies, Movie Review.Tagged Amandla Steinberg, Everything Everything, Nick Robinson.